← How Do I Manage My Time? I often find piles of receipts at client’s homes. They are stashed anywhere and everywhere you can imagine. Are they important to keep? For how long? These are the questions I get, but first things first – Where is their home? Finding a home for every type of item is important in maintaining an organized space. Where is the home for your receipts? 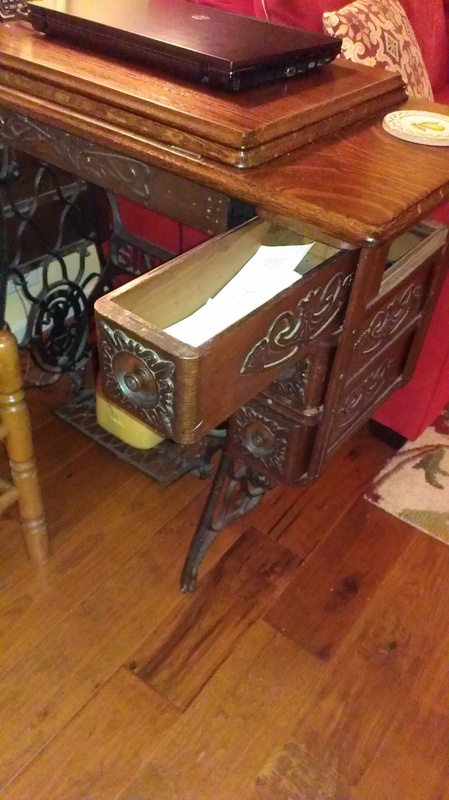 Many years ago, we relocated this old sewing machine cabinet into our family room. We are now using it as an end table, next to the sofa. It’s little (but) deep drawers are ideal for storing receipts. It took a little time to create the habit, but we place all our receipts in this home until it’s time for me to reconcile the credit card statement. This means that each month the drawer is emptied and we start anew. It’s a great feeling! I do have to say that we are pretty conscious shoppers, not really the kind of people who return things. So it’s easy to eliminate all receipts at once. If there is the odd item that ‘might’ be returned, then that receipt sits in the drawer for one more month. The cabinet is not too far from where we enter our home, so it’s easy to sweep by and empty a wallet or purse and add any new receipts to the drawer. How do you handle receipts? This entry was posted in Residential Organizing and tagged Organizing Paper, Organizing Paperwork, Paper Managment, Paperwork, Receipts. Bookmark the permalink.